Invisaling Dentist Phoenix AZ | Straighten your teeth clear dental alingers! Our practice is very excited to offer Invisalign invisible aligners, an innovative solution that allows for straight teeth in as little as 9 - 15 months! These aligners can correct overcrowding, widely spaced teeth, overbite, underbite, or crossbite. Invisalign utilizes advanced 3-D computer-imaging technology to construct your entire treatment plan from the current positioning of your teeth to your final smile. From this plan, clear thermoplastic aligners are created. These are much like teeth-whitening trays and are custom made to fit your teeth exactly. When you place the first set of aligners, they use gentle force to move your teeth into position. About two weeks later, you replace them with the next set of aligners in the series, and progress through your treatment for about a year. You only need to visit the office for evaluation every month or two. Total treatment time is based on your personal needs and goals. 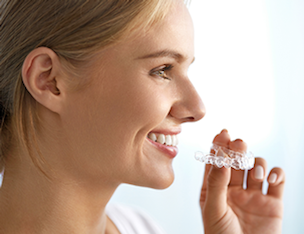 There are some distinct advantages to the Invisalign system. The best part is that no one even knows you’re straightening your teeth because the clear aligners can barely be seen! People would have to know you are wearing them, or look very closely, to be able to detect them. This will give you much more confidence in your smile during active treatment. Invisalign is also comfortable to wear. The aligners are all one piece, without any metal or wires to be checked and adjusted, so you get to spend less time at the dentist. The lack of braces, wires, or headgear also eliminates any potential mouth irritation. Then there’s the convenience factor. Even though you wear the aligners all day as well as during sleep, they are easy to remove for eating and brushing. You can eat and drink whatever you like while in treatment, without food restrictions. And keeping your teeth clean and free of plaque is a breeze, because there are no braces to restrict brushing and flossing. A straighter smile is just a phone call away! 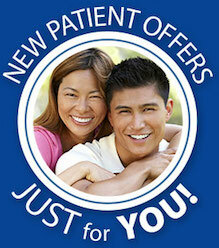 Call for a no-cost/no-obligation consultation at (602) 464-7211 to determine if you’re a candidate for Invisalign. Tuesday	7 a.m. – 7 p.m.
Wednesday	7 a.m. – 7 p.m.
Thursday	7 a.m. – 7 p.m.
Friday	7 a.m. – 2 p.m.